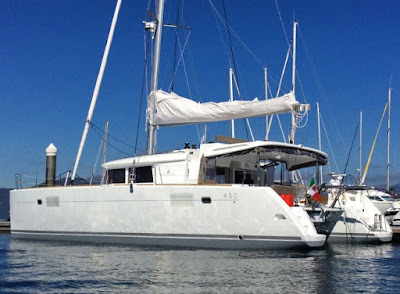 Luxury Catamaran Delicia is offering a 10% discount for the month of February, and for a Valentine's charter, champagne, chocolates and roses on arrival! Charters must be booked prior to February 1, 2016. With a name that conveys delight, DELICIA is just that - a delight in every sense of the word! She is a magnificent Lagoon 450 catamaran, newly launched and available for charters Sept.12-Oct.10 in Corfu, Greece. (She's the only Lagoon 450 chartering in Corfu.) She arrives in the Caribbean for charters starting December 2015. DELICIA features multiple fabulous lounge areas– the Flybridge, the Aft Deck, the Main Salon, and the Foredeck Lounge. The Flybridge is accessed with steps leading from the aft deck. The helmsman has maximum visibility from this raised steering platform which also has easy access to the sheets and running rigging. It’s a great location offering space for safe operation of the yacht. There's a spacious seating area as well as sunbathing lounge directly forward of the steering station. Of course, the view of the surrounding scenery from the Flybridge is truly delightful! Forward of the cabin house and just aft of the trampolines, DELICIA features the unique Foredeck Lounge area – a favorite of many and a great space to enjoy a refreshing lunch or a delicious cocktail. The interior of the yacht, designed by the Italian specialist, Nauta Yachts, is simply gorgeous. The overall design maximizes space and adds lots of luxurious touches such as indirect lighting, a hideaway cabinet for the flat-screen TV, and clever catches for the drawers and lockers. When the sliding doors are open to the aft deck, there’s virtually no separation between the interior saloon and the exterior living area - it's one big, open space! Located in both hulls are four luxurious Queen guest cabins, each with private ensuite bath and electric heads, offering luxurious accommodations for eight guests. DELICIA is fully air-conditioned throughout. Exclusive Yachts is known for providing the highest luxury to our clients and making their dreams a reality.